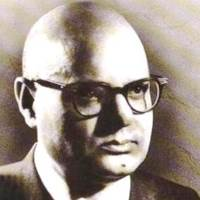 Poet, thinker and critic Noon Meem Rashid was born on 1st August 1910 in Janjua family of Village Kot Bhaaga Akaal Garh Gujranwala, Punjab. He acquired master degree in economics from the Government College Lahore and served a brief period for Royal Indian Army during the second world war where he was promoted to the Army rank of Captain. Meraji introduced free verse in Urdu Poetry for the first time. His first collection, Maavra was published in 1941. Kulliyaat-e-Rashid is actually the compilation of his three collections along with the first one, Iran mein Ajnabi, Laa masavi Insan, Gumnam ka Mumkin, Maavra. His book Jadeed Farsi shaeri (Modern Persian poetry) is an invaluable critical piece on the modern Persian poetry, Persian poets, neologisms and the revolution that the Persian poetry went through in the 20th century. He died in London on 9th Oct 1975.